McMurdo’s Camp was recently struck by lightning. Smoked our USB air-card and wireless router, and less expensive, but somewhat trickier, damaged a connector in the mini-coax between our outside antenna and the air-card. The first two were easy to figure out but not inexpensive to replace. The connector deal took a little logical thinking to pin down. But we remembered that when you have eliminated the obvious, whatever remains, however improbable, must be the case. Updates to the site have dragged as a result, but should pick up again soon. We are now investigating signal strength boosters. These devices are usually used with cell-phones, but should also work with cell-phone signal internet access. If any readers have experience with or advice on their application, we would appreciate hearing your comments. Submit below. The electronic equipment was not the only thing that was affected. 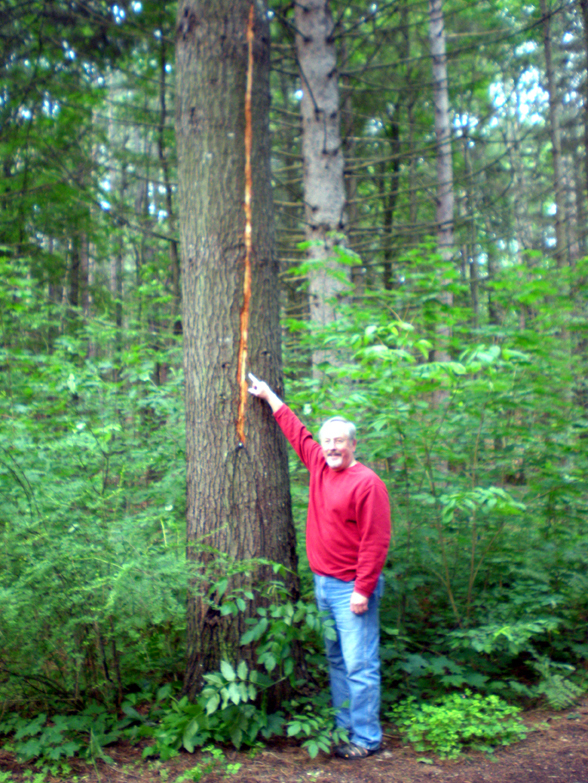 The snapshot below is one of the sawyers in the Camp pointing at a tree trunk that evidently conducted the lightning to a point near the ground. Where the “juice” went from there we don’t know. We got some tar-like gooey tree wound stuff and patched it up.